Loughborough College magazine, The Limit, was first published in 1918 and printed by The Echo Press in Loughborough. It aimed to be entertaining, instructive and stimulating and to bring together the different sections of the College. It contained a mix of serious and humorous articles; reports of College sports events, plays, and club activities; poems, cartoons and photographs; and news of former students. It also carried advertisements for College products and services and for both national and local businesses. This issue of The Limit, for April 1925, includes advertisements aimed at students for scientific instruments, stationery, books, sports equipment, trophies, and clothing from companies across the land. 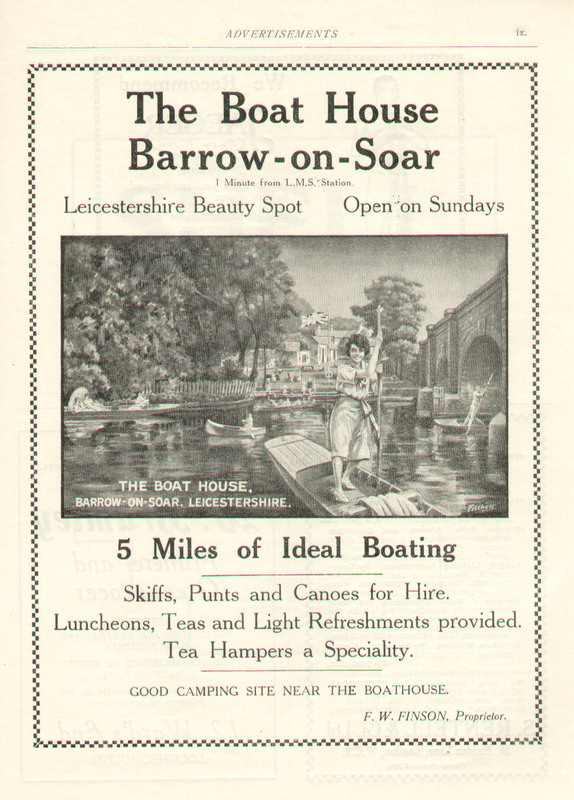 Locally, there were advertisements from the engineering firm of Herbert Morris Ltd and many other local businesses. There was Hyde Bain, Ophthalmic Opticians, in the High Street; Chas. W Tyler, Ironmonger and Seedsman (‘Wireless a Speciality’), in Derby Square; W Bramley, Greengrocer, at Ward’s End; Marsden’s the Grocers and Bolesworth’s Dairy & Tea Rooms, in the Market Place; JW Barker’s ‘Midland Hygienic Bakery’ in Mill Street; the Loughborough & Charnwood Forest Coal Co. Ltd of Baxter Gate; JT Bailey, the Butcher (‘your patronage is respectfully solicited’) and Paltridge’s Pianos (‘unrivalled for purity of tone, reliability, workmanship and intrinsic value’) on opposite sides of Church Gate; and H Lacey, (‘the best house in Loughborough for pork pies, sausages and polonies’) in Ashby Square. 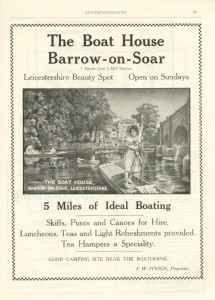 Perhaps the most attractive local advertisement in this issue of The Limit is the one for Barrow-on Soar boathouse, which might conjure up an Oxbridge-like vision of flannelled students, languidly propelling young ladies in punts – though the Loughborough young lady pictured here is making a pretty good job of punting herself!